This might not be the best Stephen King book made into a film, but it is certainly a great one. 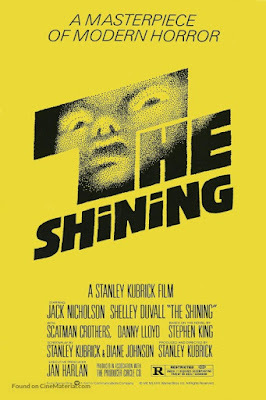 This is a Stanely Kubrick masterpiece of insanity, murder, and supernatural happenings that few movies can compare too. This is Kubrick at his best, Nicholson at his most manic, and Stephen King at his most...well, Stephen King. Connor loved this one. He had known about the movie and many of the scenes for a long time, I mean how could you not? So the movie lived up to the hype in his mind. Rewatching this now, many years later, I am struck by how much I really enjoyed Kubrick's direction here. His vision may not have been the same as King's, but it is a good vision, even a great one. This isn't just one of my favorite horror movies it is one of my favorite movies of all time. It's not perfect of course, but it is great.